New U of T Scarborough research has found that some ruby-throated hummingbirds choose to fatten up significantly before their long migratory flights south for the winter. 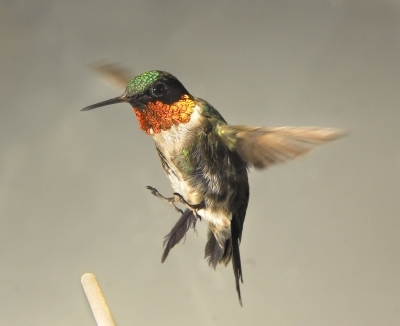 “Many different birds fatten up before they migrate, but we wanted to know what specific strategies hummingbirds use to fuel up prior to migration,” says associate professor Ken Welch. Welch and masters student Lily Hou developed a unique system to track and weigh hummingbirds in the wild before migration using radio frequency identification tags. Each bird had a microchip and were weighed each time they landed on a balance attached to the feeder. They found hummingbirds that fatten up spent more time at feeders in order to gain weight rapidly, in some cases putting on as much as 35-40 per cent of their body mass in the four days before migration. They also found that no juvenile birds were fattening meaning that those choosing to fatten up had made the migratory trip at least once. “This suggests fattening could be a learned behaviour and it’s based on experience,” says Welch. He adds the findings add to a growing body of research suggesting that for some birds their pre-migration strategies are affected by age and experience. WATCH A VIDEO ON HOU AND WELCH'S NEW RESEARCH. Birds generally use two strategies when it comes to preparing for migration. One prioritizes fattening to allow a more direct flight in order arrive at the wintering grounds quickly. The other involves shorter flights, stopping and feeding along the way. There are advantages to both, notes Welch. Short trips can be a safe strategy as long as resources can be found reliably along the way, but it can take longer to arrive at the final destination. For other birds, fattening may be necessary to take longer flights over large ecological barriers like oceans or deserts. “The reason some hummingbirds fatten up before their long flight may be to gain an advantage over potential rivals – by arriving at their wintering grounds in southern Mexico and Central America quickly they can establish territories and control the best resources,” he says. The hummingbirds that fatten for migration tended to increase their eating activity during midday and the early evening. This is unique because during breeding season hummingbirds generally only increase their eating activity in the evening before fasting for the night, while reducing it in the middle of the day. “It’s thought this is a way of keeping their mass low so they can be extra maneuverable and fight off potential rivals or impress their mates,” says Hou. Welch’s past research found that hummingbirds can fuel their highly energetic hovering flight by burning both glucose and fructose, but he says it’s important to remember these are migratory birds and that carbohydrates alone are not enough. “Migration is powered by fat. It’s extraordinary that hummingbirds can burn sugar to sustain their high metabolic rate, but it’s also amazing to think they can switch and do the same thing using just fat,” he says. The study, which received funding from the National Geographic Society and the Natural Sciences and Engineering Research Council (NSERC), is available online in the journal Animal Behaviour.